Melissa Newman-Evans presents a telegram to Intern Steve at the Encyclopedia Show: Somerville. Photo by Marshall Goff. Melissa Newman-Evans represented the Cantab as part of the venue’s slam team at the 2009 NorthBEAST Regional Poetry Slam and took top honors (along with duet partner Kevin Spak) at the Cantab’s first-ever Group Piece Slam that same year. She was a two-time National Poetry Slam semi-finalist with the 2012 and 2014 Boston Poetry Slam Teams. Her work has been featured in Side B Magazine, Muzzle Magazine, decomP, Radius, and PANK. 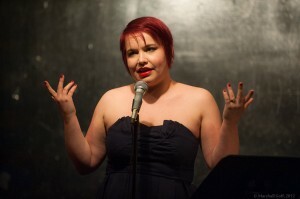 Melissa Newman-Evans features at the Boston Poetry Slam on December 5, 2012. Photo by Marshall Goff. Melissa has provided print production and graphic design work for a wide range of the Boston Poetry Slam family of shows, including the Encyclopedia Show: Somerville, the 2011 National Poetry Slam, and the 2013 National Poetry Slam where she served as Art Director. She and Kevin Spak coached the Emerson College slam team from 2012 to 2014, the years when she also operated as a server for the Cantab Lounge every Wednesday night. Melissa relocated to Denver, Colorado in the summer of 2014, and was a National Poetry Slam Finalist with the Denver-Mercury team in 2015. She still helps to maintain the Boston Poetry Slam tumblr page alongside Cassandra de Alba, and may be reached by email.